Prime Minister Nehru Visits U.S.
Obama Invites Modi to U.S.
Britain declares the end of its colonial rule of the subcontinent and passes the Indian Independence Act, which divides the territory into Muslim-majority Pakistan and secular India, whose population is majority Hindu. Violent clashes between Hindus, Sikhs, and Muslims follow, and as many as a million die in bloodshed amidst the forced migration of up to twenty million people. Prime Minister Pandit Jawaharlal Nehru meets with U.S. president Harry S. Truman on a multi-week tour tour of the United States. The trip precedes India’s formal proclamation of neutrality in the developing Cold War, in which it would take a leadership role within the Non-Alignment movement. This sets the tone for U.S.-India relations throughout the Cold War, creating constraints within the relationship, as well as opportunity for amity between Delhi and Moscow. President Dwight Eisenhower is the first serving U.S. president to visit the country. Eisenhower meets with President Rajendra Prasad and Prime Minister Jawaharlal Nehru, and addresses Parliament. 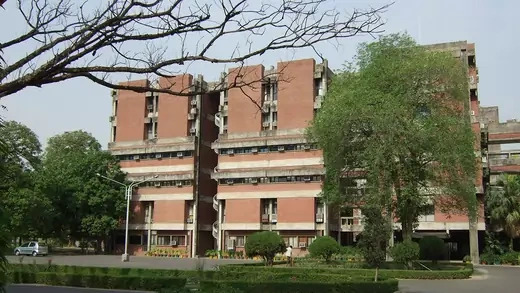 Nine American universities and the U.S. Agency for International Development (USAID) help establish one of the first Indian Institutes of Technology. Under the Kanpur Indo-American Program [PDF], American faculty members develop academic programs and research laboratories at the new university over a decade. The partnership is one of many examples of higher education collaboration between the two countries. War breaks out between India and China over a disputed frontier. Prime Minister Jawaharlal Nehru writes to President John F. Kennedy to request support from the United States. Washington supports India in the conflict, recognizing the McMahon line as the border, and provides air assistance and arms. Until the 1965 Inda-Pakistan War, strategic and military ties between Washington and Delhi remain close. Norman Borlaug travels to India to begin testing high-yield wheat varieties. His collaboration with Indian scientist Dr. M.S. Swaminathan results in the “Green Revolution,” and India goes from food scarcity to self-sufficiency within a decade. India and Pakistan become embroiled in their third conflict as Pakistan descends into a civil war that ends with the creation of Bangladesh, formerly East Pakistan, on December 6. Despite evidence of the Pakistan Army’s violence against its own citizens in East Pakistan, the United States sides with Islamabad, given its mediating role in Nixon’s rapprochement with China. India also signs a twenty-year Treaty of Friendship and Cooperation with the Soviet Union in August, sharply deviating from its previous position of non-alignment in the Cold War. 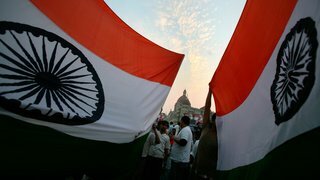 India detonates its first nuclear device, becoming the first nation outside the five permanent members of the United Nations Security Council to have declared nuclear capabilities. The move contributes to a period of estrangement between the United States and India that lasts over two decades. U.S. President Jimmy Carter visits India on a three-day official trip to meet with Indian President Neelam Sanjiva Reddy and Prime Minister Morarji Desai, and address Parliament. Desai reciprocates with an official six-day visit to Washington in June. The Carter administration enacts the Nuclear Nonproliferation Act, which requires countries not included in the Nonproliferation Treaty—which includes India—to allow inspections of all nuclear facilities by the International Atomic Energy Agency. India refuses, and Washington ends all nuclear assistance to Delhi. Prime Minister Indira Gandhi is assassinated at her New Delhi residence by Sikh security guards seeking vengeance after her authorization of a military attack on a revered Sikh temple in Amritsar five months prior. 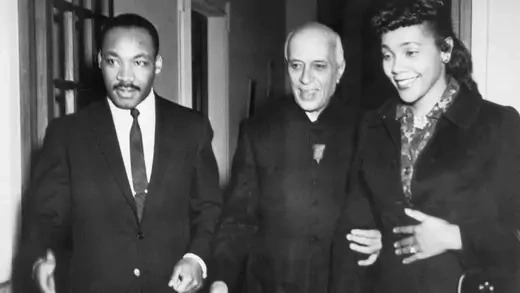 Gandhi, the daughter of India’s first prime minister, Jawaharlal Nehru, first took office in 1966. She made a state visit to Washington in 1982, which was followed by a high-level U.S. visit led by Vice President George H.W. Bush. She is succeeded by her son, Rajiv. A toxic gas and chemical leak at American-owned Union Carbide Pesticide Plant in Bhopal, India, kills thousands. 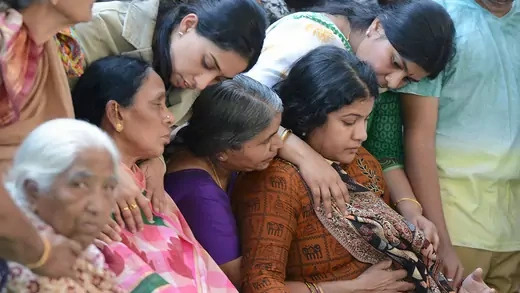 India unsuccessfully seeks extradition of the company’s chief executive from the United States for criminal prosecution as the death and disability toll climbs to the tens of thousands in the ensuing years. The incident harms U.S.-India relations, and continues to complicate the bilateral relationship years after. Deputy National Security Advisor Robert Gates travels to India and Pakistan to defuse tensions over the rapidly escalating insurgency in Kashmir. The trip comes amid fears of potential nuclear warfare between Pakistan and India. The government of Prime Minister P.V. Narasimha Rao launches sweeping economic reforms that help expand economic ties with the United States. Finance Minister Manmohan Singh oversees the opening of India’s economy to international trade and investment, deregulation, initiation of privatisation, tax reforms, and inflation controlling measures that catalyze decades of fast growth. The Indian government announces the completion of a series of underground nuclear tests close to the border with Pakistan, surprising U.S. intelligence organizations and raising fears the move could spark a regional nuclear arms race. The tests draw international condemnation and badly damage India’s relationship with the United States. After recalling the U.S. ambassador to India, President Bill Clinton imposes economic sanctions, required under U.S. law. Pakistani forces infiltrate Indian-administered Kashmir. India launches air strikes in return, and armed conflict continues through early July. After President Clinton summons Pakistani Prime Minister Nawaz Sharif to Washington for a Fourth of July emergency meeting, Sharif withdraws Pakistani forces from their positions beyond the Line of Control. President Bill Clinton makes the first U.S. presidential trip to India since 1978. The visit ends the estrangement of the post-1998 Indian nuclear weapons tests, although the Clinton administration presses India’s government to sign the Comprehensive Test Ban Treaty. The Indo-U.S. Science and Technology Forum is also established during the visit. As India’s economy begins to take off, the trip indicates a further shift in Washington’s regional orientation away from its Cold War alliance with Pakistan. The George W. Bush administration lifts all remaining U.S. sanctions that were imposed on India after its 1998 nuclear test. Most economic sanctions had been eased within a few months of their imposition, and Congress authorized the president to remove all remaining restrictions in 1999. U.S. Secretary of State Condoleezza Rice visits New Delhi, where she and Indian officials agree to start a dialogue on energy security. The visit underscores an upswing in relations despite tensions over India’s possible energy cooperation with Iran and the U.S. sale of fighter jets to Pakistan. The United States and India sign the New Framework for the U.S.-India Defense Relationship [PDF], which sets priorities for defense cooperation in maritime security, humanitarian assistance/disaster relief, and counterterrorism. In October, the two countries conduct the largest naval exercise to date, followed by major air and land exercises. India and the United States ink the Civil Nuclear Cooperation Initiative, a ten-year defense framework that lifts a three-decade U.S. moratorium on nuclear trade with India. Under the agreement, India agrees to separate its civil and military nuclear facilities and place all its civil resources under IAEA safeguards. In exchange, the United States agrees to work toward full civil nuclear cooperation with India. Congress gives final approval in October 2008. U.S. President George W. Bush makes a visit to India, where he and Indian Prime Minister Manmohan Singh finalize the framework of the civil nuclear deal and boost security and economic ties. The nuclear deal, completed in July 2007, makes India the only country outside of the Nonproliferation Treaty that has nuclear capabilities and is allowed to participate in nuclear commerce. 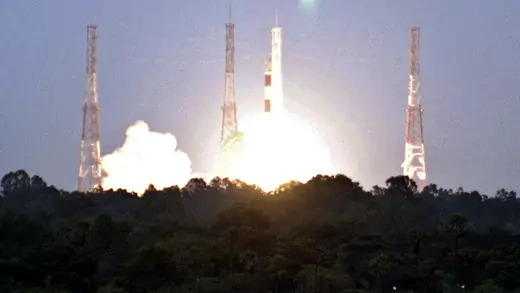 Chandrayaan-1 becomes the first Indian spacecraft to land on the moon. It carries two scientific instruments designed by NASA scientists, which later discover water molecules on the moon’s surface. The achievement is one of many resulting from ongoing U.S.-India space cooperation dating back to 1963. Lashkar-e-Taiba terrorists from Pakistan attack the Taj Mahal Palace Hotel in Mumbai. More than three hundred citizens die in the three-day conflagration, including six Americans. The United States cooperates closely with Indian authorities, sending FBI investigators and forensics experts. U.S. President Barack Obama hosts the inaugural state visit of Indian Prime Minister Manmohan Singh. Despite its symbolic importance, the trip fails to yield any significant breakthroughs in the bilateral relationship. U.S. Treasury Secretary Timothy Geithner makes his first official trip to India to launch the new U.S.-India Economic and Financial Partnership with Indian Finance Minister Pranab Mukherjee. The ministerial-level meetings kick off an effort to institutionalize deeper bilateral relations on economic and financial sector issues. The United States and India formally convene the first U.S.-India Strategic Dialogue. A large, high-ranking delegation of Indian officials visits Washington, DC, and Secretary Clinton lauds India as “an indispensable partner.” President Obama says the relationship “will be a defining partnership in the twenty-first century.” Subsequent dialogues follow annually. President Obama visits India, where he addresses Parliament and backs the country’s long-held bid for a permanent seat on the United Nations Security Council. The trip also highlights the countries’ economic ties, with Obama announcing $14.9 billion in trade deals. However, trade concerns around access to Indian markets and issues surrounding civil nuclear cooperation cloud the talks. The United States and India sign a Memorandum of Understanding in New Delhi to promote closer cybersecurity cooperation. The agreement is designed to fulfill one of the pillars of the U.S.-India Strategic Dialogue. Secretary of Defense Leon Panetta visits India to bolster military ties in the wake of the Obama administration’s announced “pivot” to Asia. The trip marks the first such visit since former Secretary of Defense Robert Gates met with Indian counterparts in January 2010. Manmohan Singh visits Washington in his last visit to the United States as India’s prime minister. The trip, which focuses on security, trade, immigration reform, and the civilian nuclear deal, marks the third meeting between Singh and Obama in four years. It comes amid a backdrop of domestic political issues in Delhi, a troubled Indian economy, and a government shutdown crippling Washington. The U.S. embassy in India announces Ambassador Nancy Powell’s resignation in the wake of a dispute over the arrest of an Indian diplomat in New York. The announcement comes amid the run-up to high-profile national elections. 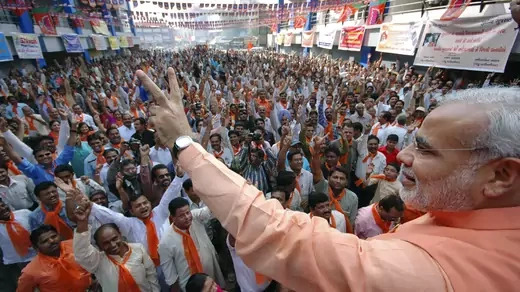 The Hindu nationalist BJP party wins national elections in a landslide, elevating Narendra Modi to prime minister. President Barack Obama congratulates Modi and invites him to the White House, reversing an earlier visa ban. Modi had been barred from entering the country over U.S. concerns about the 2002 massacre of Muslims in the state of Gujarat, which occurred when Modi was the state’s chief minister. Narendra Modi makes his first visit as prime minister to the United States, aiming to attract investment and firm up the U.S.-India strategic partnership. Modi's events include a sold-out speech in New York's Madison Square Garden and meetings with U.S. business executives. In Washington, Modi and President Obama reach agreement on a memorandum of understanding between the Export-Import Bank and an Indian energy agency, which provides up to $1 billion to help India develop low-carbon energy alternatives and aid U.S. renewable energy exports to India. U.S. President Barack Obama makes his second visit to India as head of state for India's Republic Day celebrations. The president heralds the relationship between the world's two largest democracies, saying, "America can be India's best partner." Obama and Indian PM Modi announce a breakthrough on nuclear-related issues that could help implement the U.S.-India civil nuclear deal. Six months later, U.S. Secretary of Defense Ashton Carter and India’s defense minister, Manohar Parrikar, sign documents to renew the ten-year U.S.-India Defense Framework Agreement. During Prime Minister Modi and President Obama’s final meeting in the White House, the United States elevates India to a major defense partner, a status no other country holds. 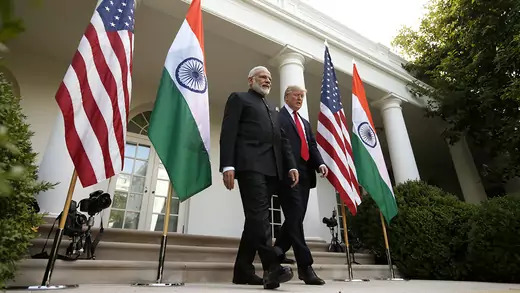 An expansion of the ten-year defense agreement renewed in 2015, the designation, which became law in August 2018, means that India will enjoy some of the benefits of being a U.S. treaty ally, such as access to defense technology, though the alliance is not a formal one. 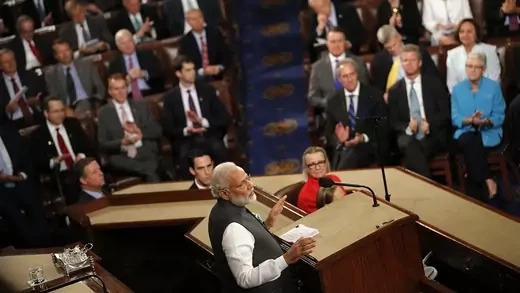 In a speech before Congress a day later, Modi celebrates his country’s growing diplomatic and economic ties with the United States. Two months later, the United States and India sign an agreement on deeper military cooperation after nearly a decade of negotiations. After confronting two Indian men at a restaurant in Kansas, yelling “get out of my country,” a white man shoots the two men, as well as a third who intervened. One of the men, Srinivas Kuchibhotla, dies, and his friend, Alok Madasani, and the bystander are injured. India sends nearly one-fifth of the foreign students studying in the United States and more than three-quarters of the highly skilled workers approved for H-1B visas [PDF], but the racist attack sparks concern among Indians that the United States is not safe for them. Increasing anti-immigrant rhetoric causes some prospective applicants to rethink their plans. President Donald J. Trump welcomes Prime Minister Modi to the White House for their first face-to-face meeting. Though Trump had raised sharp disagreements with India over trade, climate change, and H-1B visas, these issues are sidelined during the leaders’ summit, and their joint statement emphasizes strengthening their defense partnership, cooperating on counterterrorism efforts, and boosting economic ties. 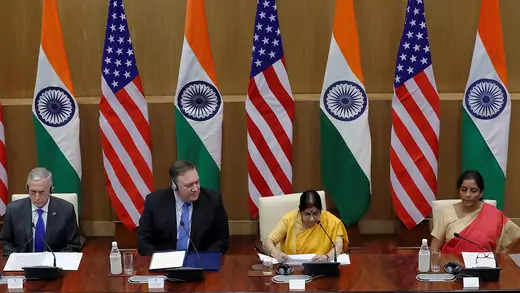 During a “two-plus-two” dialogue in New Delhi, U.S. Secretary of State Mike Pompeo and Secretary of Defense Jim Mattis sign an agreement with Indian Minister of External Affairs Sushma Swaraj and Defense Minister Nirmala Sitharaman. The Communications Compatibility and Security Agreement (COMCASA) gives India access to advanced communication technology used in U.S. defense equipment and allows real-time information sharing between the two countries’ militaries. The agreement had been under negotiation for nearly a decade.